Real estate in the Wildwood neighborhood draws in potential residents for a number of reasons. 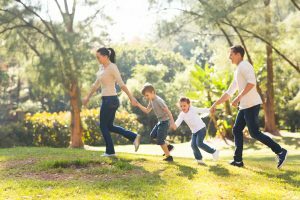 Not only are homes in the area beautiful and well-maintained, the neighborhood is virtually surrounded by parks and outdoor areas. To the north, Wildwood is bordered by Peachtree Creek and to the east, residents can take a quick walk and end up at Atlanta Memorial Park, which is one of the best parks in the city. Home prices in Wildwood tend to be higher than average, but that shouldn’t be a deterrent for those who want a neighborhood with excellent schools and nightlife, along with some of the lowest crime rates in Atlanta. The area is also filled with tall trees that make the neighborhood beautiful all around. Homes and rentals are more expensive in Wildwood than elsewhere in Atlanta, with the median home value being $617,627 and the median rent sitting at about $1,300 per month. Naturally, this draws higher income residents to the area. People living in Wildwood have an average income of $126,248 per year, making it one of the wealthiest neighborhoods in the city. About 41 percent of the people living here have a master’s degree or higher, and 46 percent have a bachelor’s degree. When you buy a home in the neighborhood, you will more than likely find that your next-door neighbors are executives, managers or other professionals, as 71 percent of the neighborhood has these types of jobs. Only about 17 percent of those who rent or own homes in Wildwood work in sales and retail, while the remaining residents work as clerks, laborers, assistants or manufacturers. When the work week comes around, Wildwood residents tend to commute by car. There are relatively few public transportation options around, as the Metropolitan Atlanta Rapid Transit Authority (MARTA) only covers the neighborhood with two bus lines. The number 12 bus line cuts through the middle of the community, while the number 94 line intersects with Wildwood on its southern boundary. Owning a car is a necessity for most people who live in Wildwood. Portions of Wildwood are very walkable, but overall it is hard to run errands or commute to work without a car. The southern tip of the neighborhood, specifically where Collier Road and Howell Mill Road come together, has an abundance of shopping and dining establishments that are easy to walk to, which is great for people who rent apartments in the south end of the neighborhood. However, those who own houses in the northern end will almost always find that a car makes life easier. As is typical in many wealthy neighborhoods, Wildwood has a low crime rate. Not only is it one of the safest communities in Atlanta, its crime rates are also well below average compared to national statistics. This helps residents feel secure at home and when doing activities out in the community. There are many popular things to do in Wildwood. Many of them relate to the outdoors due to the fact that the neighborhood is situated near so many parks. The best of these is perhaps Atlanta Memorial Park. Getting to the park requires a short walk or drive through the Springlake neighborhood. Once there, you can enjoy a wide variety of walking trails along the Peachtree Creek. Best of all, the park connects to a completed branch of the Beltline, Atlanta’s multi-use trail system. Testing your skills at the Atlanta Rocks! Indoor Climbing Gym, which holds classes as well as independent climbs. Walking around the Atlanta Food Truck Park & Market, where you can sample food, have a picnic, buy fresh produce and view work from local artisans. Playing a round of golf at the Cross Creek Golf Club, located on the northern border of the neighborhood. Walking around the Howell Mill Village shopping center, where you will find a variety of stores and restaurants. Getting some exercise at fitness centers such as Orangetheory Fitness, Westside Yoga and Bangkok Boxing Fitness.